Aluminium Profiles vs uPVC profiles: Which is better? Ever wondered why the uPVC profiles replaced its Aluminium counterparts? The answer is simple, uPVC profiles are better in every aspect. We often come across people complaining about the faulty framework which holds together architectural essentials to our homes. Rotting and termite attacks are familiar woes for wooden profiles. The Aluminium profiles, when taken into consideration face far complex challenges. Aluminium profiles rust and cause corrosion when they get oxidized upon contact in the air. The AlO(Aluminium Oxide) forms a white powdery coating over the metal profiles. These profiles get brittle, dented and break over the time as well. The polymer and additive coupled uPVC profiles are impervious to corrosion. They also possess a high composite strength that prevents major dents. Aluminium is not stain resistant. Water splashes and dust tend to easily accommodate on its surface. These stains are not easy to get rid of. When compared to uPVC profiles, its structural properties make it waterproof. The superior finish does not allow any particles to stick on it and its anti-staining feature makes it easy to clean the uPVC profiles. High maintenance of these profiles makes it a duller choice in terms of visual aesthetics. In contrast, uPVC have magnificent colors variants and accompany similar fittings with bare minimum maintenance. Not only Aluminium looks dull in comparison to wood or other polymer variants also the color options are very limited. But with uPVC alternates, you get superior finishing and great colors that will give your senses a visual treat. Aluminium profiles aren’t really ideal. From fabrication to implementation, the entire process will cost you some serious bucks. Shaping and welding of the metal also require special equipment and trained personnel to execute plans in a desired manner. 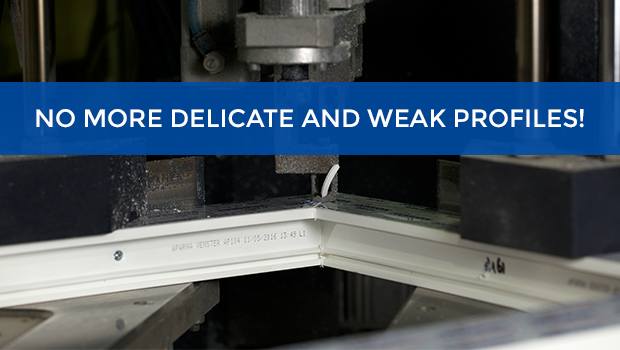 We don’t need to say how cost-effective and power friendly uPVC profiles are. In addition to being 100% recyclable, the power used to manufacture these are really low. It is very easy to work on this profile and you get optimum customization at minimal pricing. Being a metal Aluminium conducts heat efficiently which is not ideal in case of extreme temperatures. Meanwhile, the uPVC provides a hassle-free experience in all weather extremes. It reflects sunlight and is a great thermal insulator. These profiles are ideal partners for air conditioning units. Additionally, in humid conditions, aluminium frames also permit for condensation or even frost to form on the interior surface of the window which and can pose a whole range of issues. But with uPVC structures, there is no danger of condensation of frosting.